One Click. Any Device. Any time. 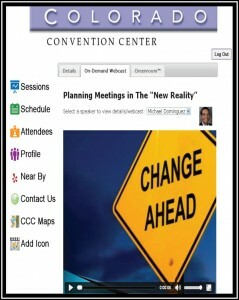 Image Audiovisuals offers a mobile event app to keep your attendees informed of all aspects of your conference, from schedules to attendee info, to presenter bios and local happenings. Our app categorizes and stores all of your recorded content to watch on demand. Our recording library is sponsorship enabled, allowing you to offer sponsorship opportunities to create new revenue streams for your association. Our on-demand webcasts are available long after the conference is over, allowing event sponsors to receive maximum exposure, making your sponsorships a better investment for partnering companies.